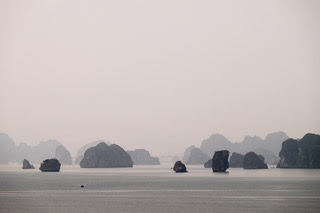 Jon Fleming Travelogue: March 23rd – What’s Happened To Ha Long Bay? The Ha Long Bay we visited today is completely different to the Ha Long Bay we first visited 10 years ago, which would have been totally different to how it was 10 years before that. Unfortunately, you'd have to say that all this change has not been for the better. Of course, the natural beauty of all those dramatic islands sticking out of the green waters of the bay, cloaked in an enigmatic mist hasn't really changed. But, it's what's happening on land that's quite alarming. 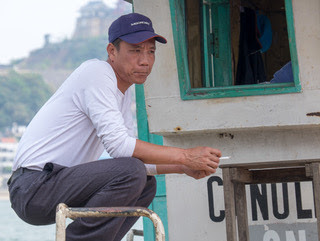 This used to be just a small fishing village, but it's now an ever-expanding town of amusement parks, ferris wheels, cable cars and tourist bars. To me, all these modern entertainment venues seem to have very little in common with the sublime landscapes offshore, but I guess that's "progress". The tacky is taking over from the timeless. 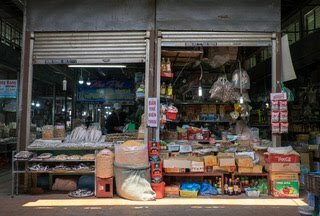 Actually, Hong Gai – the town that the Shuttle Bus takes you over, on the other side of the bridge from the amusement parks – would be a perfectly nice town in most other circumstances. 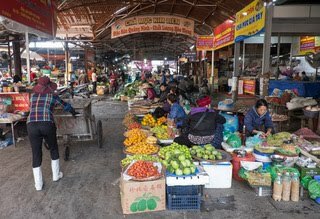 It's not too busy (so you don't fear for your life just crossing the road, which can happen in other Vietnamese towns), the market is interesting, and the people generally friendly, although there are no "sights" as such. 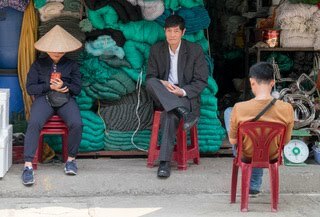 Where we're dropped off, really sums up the contrasts of Vietnam's rapid modernisation. You can turn right, and head into a glossy 4-storey mall selling the kind of upmarket goods that are out of reach of the ordinary Vietnamese (it was pretty much empty, but I presume that it's aimed mainly at Chinese tourists). 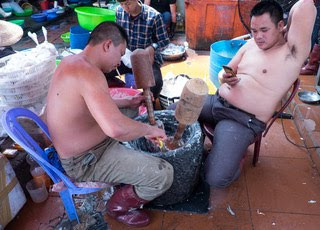 Or, you can turn left and head into a down-and-dirty traditional wet market, that scarcely makes a nod to modernisation. 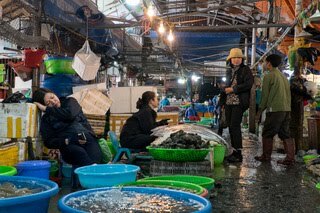 This bustling place really puts the "wet" into "wet market", as you step through puddles and past overflowing bucketfuls of all kinds of weird and wonderful fish. A fun place to explore, but not recommended in flip flops! 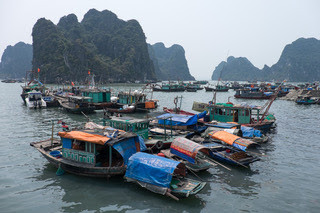 So, Hon Gai is OK to visit for a few hours, but if you're missing out on a trip to Hanoi (admittedly a 4-hour trip away), or the treasures of the Ha Long Bay islands, then you're short-changing yourself. Having just done both those trips in November, I was happy to take it easy and survey the "progress" (or the damage) that was taking place on land.